So in a bizarre feat of scheduling, I was back in Paris a couple of weeks after my day with K and J. This time it was to see new family, namely nephew G who had just arrived in the world about a month earlier. This trip also coincided with C's birthday, so on a Sunday evening, C, A and I headed out for a traditional French bistro experience. Again I placed our trust in David Lebovitz, who so far has not done anything to make me think he is anything up a genius, and Chez Paul was agreed upon, since it was within walking distance of where we were staying. 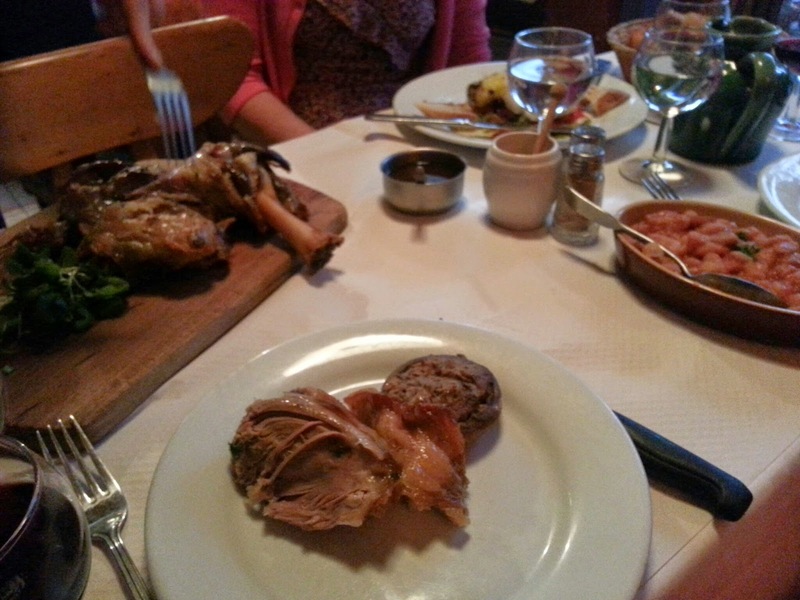 Due to a day full of eating, we skipped starters and went straight for mains - C chose cod, which she was delighted with, and A and I shared a lamb shank for two, which was so incredibly tender and full of flavor that the two of us finished off the whole thing, even though it was enormous. Some side dishes accompanied the lamb - mushrooms, and giant beans in a tomato sauce - all of it just right for a relaxed dinner. We couldn't decide on dessert or cheese, so decided to get some cheese and then see how we felt. The cheese selection was again very well judged - served at the right temperature with some lovely crackers and breads, I think. And while we would have ordered dessert if a server came by, for some reason after cheese we were completely ignored. There are worse things than being ignored in an alcove in a lovely French bistro - but it did mean that by the time we got someone's attention we were ready to depart so we headed off without a little sweet to finish off the meal.